Susan Baird first visited the gold-rush era town of Hill End in 2006, and was immediately captivated by what she refers to as a “landscape of imagination.” This small town scattered with remnants of its former glory may be of mild historical interest or tourist appeal to some, yet over the last century Hill End has enthralled a number of Australia’s most celebrated artists. In this current exhibition Baird contributes her individual voice to a deep regional artistic legacy, creating paintings that spring as much from physical topography of place as they do from a potent emotional and sensory response to it. Hill End and its surrounding rural landscape has been indelibly shaped by its colonial past. Here miners’ cottages from the 1850s, stone fruit trees, conifers, and antique roses all vie with Australian natives and the ever-encroaching bush. Certain buildings have been preserved, evidence of the large population and thriving gold industry that the town once supported as thousands flocked to its gilded soil. Imprinted with echoes of its boom and bust past, this living town is laced with casual desolation, and has called to Baird for close to 8 years. 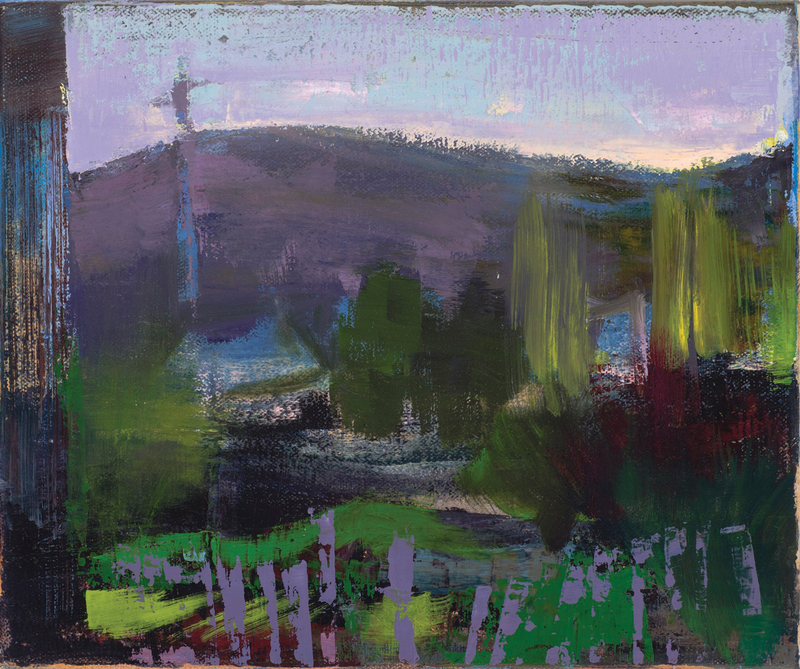 Baird’s practice often involves working outdoors, en plein air observing the changes in light and atmosphere and how these can vastly affect the appearance of a chosen spot. 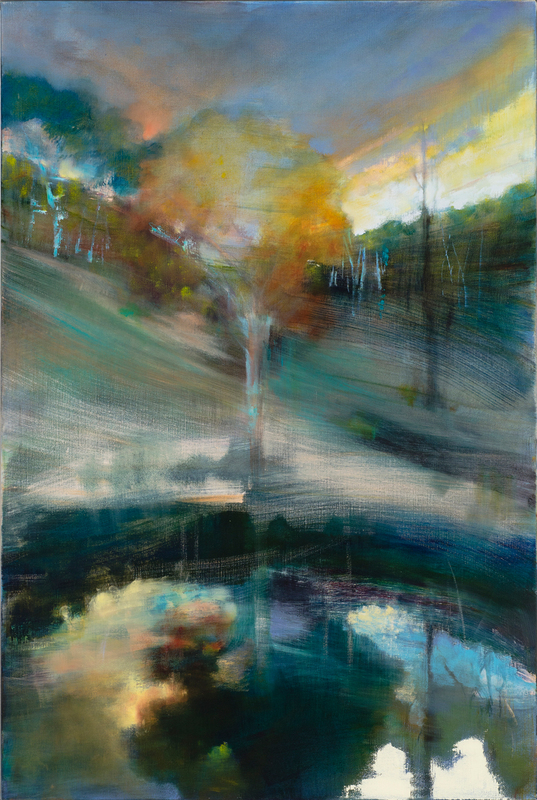 Some of her larger works take in a pond and its reflections at Tamboroora, an old mining outpost in the vicinity of Hill End. Here she captures the flood of light that occurs at day’s end, and channels the transformative power of light to shift the ordinary to the extraordinary. These large works have an otherworldly quality as with broad brush strokes and glowing colour Baird effectively captures the liminal zone between night and day, and its particular transient magic. 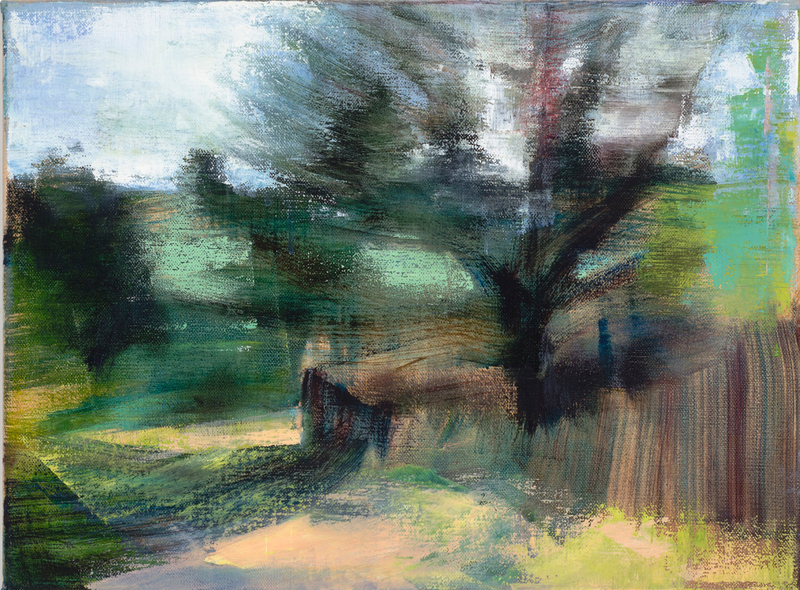 In other smaller works she tracks shifts in season, with bright springtime bursts of lime green or swathes of burnt orange that reflect changes in vegetation. Occasionally the same location reappears in different works, caught at a different time of day or night. 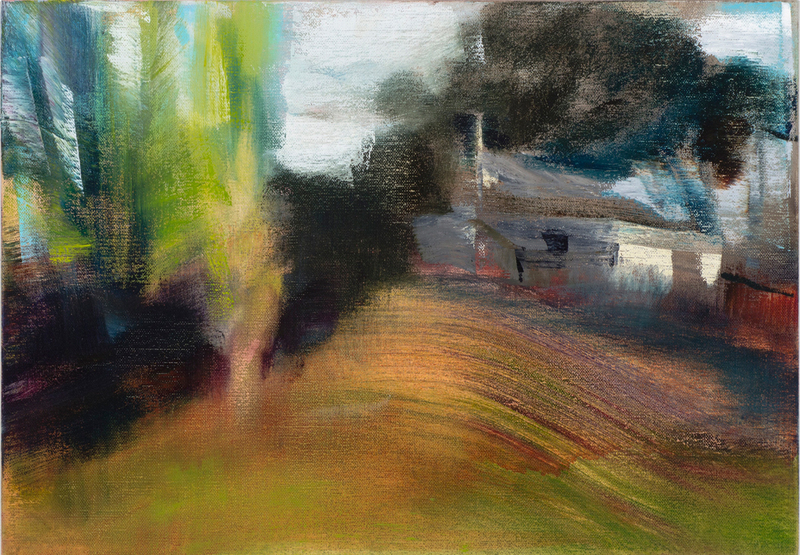 Such observations display a sense of connection with the cyclic rhythms of nature – an awareness that can only be arrived at through time immersed in this rural setting, experiencing its changes first hand. Yet Baird’s paintings are not just based on pure observation of visual phenomena. When she returns to the studio the artist sets about harnessing a remembered moment, conjuring the interplay of form, shape, light and colour to distill sensations and emotions experienced while out in the field. It is this that drives her practice, the search for a visual language that expresses both optic memory and her own internalized reaction to it. 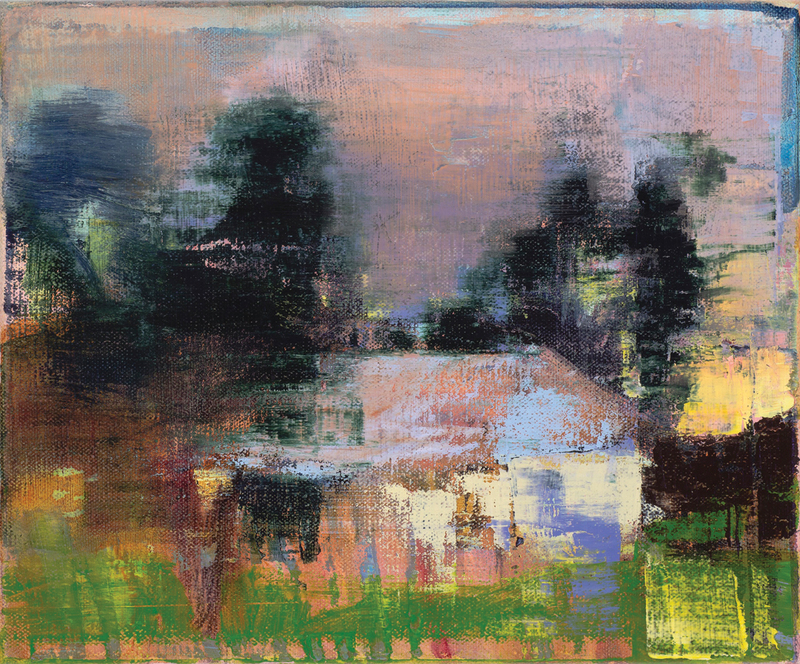 Some of Baird’s abandoned landscapes convey a moving sense of nostalgia. In other works her vibrant use of colour and swift brushwork generate an immediacy that speaks optimistically of the present. Yet tying all together is the artist’s poetic rendition of land and sky, amid the faded remnants of what once was. Tags: art, Australia, Australian art, contemporary art, Country Life, History, landscape, painting. Bookmark the permalink. Thank you for introducing me to this artist. A wonderful interplay of colour and texture which produces a dreamlike vision of the landscape. So glad you enjoyed the work starry bird.. they are dreamlike indeed. Thanks so much Website glad you’re enjoying it.